On Country trips are supporting strong and connected intergenerational knowledge transfer in the Great Victoria Desert. Following on from 2017’s successful return to Country trip, Rangelands NRM supported the second trip which took place in May 2018. Rangelands NRM Desert Program Manager Chris Curnow said additional funds were leveraged to allow Spinifex Land Management to organise and coordinate a week-long event. “Nearly the entire Tjuntjuntjara community—including Spinifex Tjilpi (Elders), Spinifex and Pilki people— shifted en masse north to camp at Ilkurlka and visit key remote cultural sites,” he said. Ilkurlka is one of the most accessible of the important Spinifex Country sites. Over the past 15 years Pila Nguru Aboriginal Corporation have, on occasion, accessed funds to support Tjilpi to find and begin mapping remote sites with a helicopter. 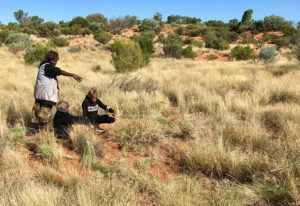 In 2017, Spinifex Land Management began taking the Spinifex Tjilpi (Elders), accompanied by the Rangers, back to those important key cultural sites to begin appropriate cultural protocol introductions and culturally-sensitive discussions of future management. “The May 2018 event allowed wider family members to begin visiting these sites with their family elders for the first time,” Sam said. Coordinator, Pila Nguru Aboriginal Corporation Sam Doudle said the importance of this work from a cultural, environmental and individual and community wellbeing perspective is inestimable. “There are not many places left in Australia—or perhaps the world—who still have enough culturally-strong and knowledgeable elders who each have the unique and innate ability to share their lived pre-European culture and livelihood with their following generations,” Sam said. Sam said these trips are important to ensure that the rangers have on-going Cultural Authority to act, manage, react and intervene with landscape scale management actions on and for Spinifex and Pilki Country. Image (top): 4 members of the Rictor family, the last group of Aboriginal people to come out of the desert in 1986, about to take Mick Rictor back to his birth place. Image (right): Spinifex Elder, Kathleen Donegan took her daughter and granddaughter to her birth place for the first time.